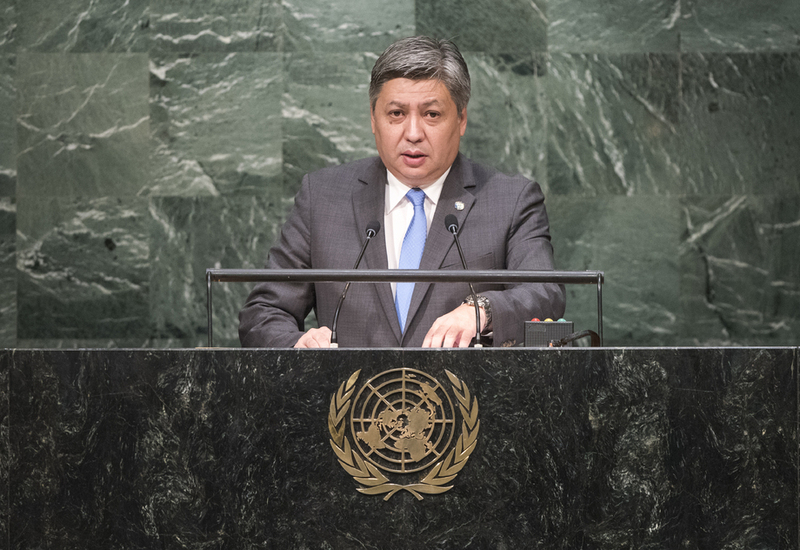 ERLAN ABDYLDAYEV, Minister for Foreign Affairs of Kyrgyzstan, said that after a quarter century after the end of the cold war, the international community was once again faced with the threat of a polarized world, gross violations of international law, and an increase of armed conflicts. Instead of the diminished Berlin Wall, new “invisible” walls of sanctions, bans and trade barriers had been erected. On the 2030 Agenda, he said the pursuit of the Sustainable Development Goals should seek to protect the equal right of States to development. Respect for the rights of each State to development should be the foundation of just international relations, along with principles such as territorial integrity, sovereignty, non-intervention and rejection of the use of force. The Treaty on a Nuclear-Weapon-Free Zone in Central Asia represented a significant contribution to the global process of nuclear disarmament, he said, expressing its appreciation to the Russian Federation, China, France and the United Kingdom for the ratification of the protocol on negative security assurances and urging the United States to ratify that instrument. On the issue of shared use of water resources in Central Asia, he said his country aimed to realize its right to development by focusing on hydropower as a basis of sustainable development. To resolve the outstanding boundary issues in the region, it was necessary to promote the increase of transit potential and development of border infrastructure. The time had come to create a broad dialogue platform among all five Central Asian countries, because the lack of direct multilateral political dialogue exacerbated regional problems and barred economic development of the respective nations.